Miran Elbakyan is a master of modern metal art, including home decor, office decorations and garden sculptures. His unique metal sculptures make him a blacksmith and an artisan, a contemporary professional of the art of metal. Fascinated with the expressive elasticity of wrought iron, Miran forges metal into beautiful abstract shapes, utilitarian or artistic. 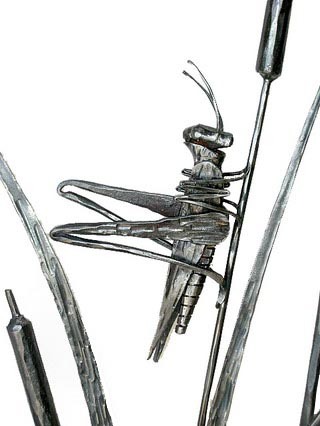 Metal sculptures, hand-crafted and often custom-made, are the epitome of his ironwork. Softness and subtlety intertwines with Miran’s craft of artistic forging. Miran makes all that could be made of wrought iron: iron fences, gates, sconces, candleholders, rails, grills, garden furniture, gazebos, and fireplace accessories, but metal sculptures are among his favorite creations. Utilizing his own contemporary designs, he sometimes combined iron with glass, stone or wood. His handiwork already decorates hundreds of private homes, restaurants, wedding halls and hotels. Miran’s whimsical abstract sculptures lean towards surrealism and grotesque, humor and surprise. His lines are always in motion, always striving to fly, to dance, to excel, while his imagery is fluent and expressive. Ornamental lacy curtains, made of wrought iron, curl around each other in a sensual tango, transparent and delicate like elaborate filigree, as if dancing in the wind. In another composition, master demonstrates his flare of abstract urbanity, creating a maze of spiraling metal bars, a labyrinth of highways in a big city. Little cubes are lost in there, struggling to get out like all of us, trying to make sense out of our hectic existence. Many of Miran’s sculptures are figurative metaphors or personalized emotions. Some rear in defiance. Others droop, resting. While a sad image of a musician pours gentle, lamenting notes over the viewers, exuberant birds celebrate their freedom, weaving aerial waltz around each other. Miran’s silhouettes could impersonate the mystery of music or spark intensely private thoughts of love and laughter. Even his utilitarian, two-dimensional pieces conceal underlying emotional content. A strictly decorative wall panel could be an arrogant seducer, aware of its irresistible allure, while the shape of a mirror could resemble a lush, curvy courtesan who tempts anyone approaching: Admire me! Admire yourself! The master of iron and fire, a metalworker, a sculptor and a blacksmith, Miran creates sculptures that reflect his clients’ personalities and the shape and quirks of available space. Customized art is the sculptor’s motto. Install his art in your home, office or garden and you won’t be disappointed.